It’s been two weeks (well two and half to be precise) since I took voluntary redundancy and the time has flown by. You often hear of people who on reaching retirement age say they don’t know where all the time goes. Well I’m not fortunate enough to be retired but I can sympathise with the time element. So if I’ve been busy what have I been doing? Well for starters I’ve been out on the bike a few times particularly as the weather hasn’t been too bad the past week or so. There were also a couple of things I wanted to do around the house. One was to paint the spare room that I call my study. In the nine years I have been in this house this particular room has barely seen a paint brush let alone a coat of paint. However it was time for a freshen up. 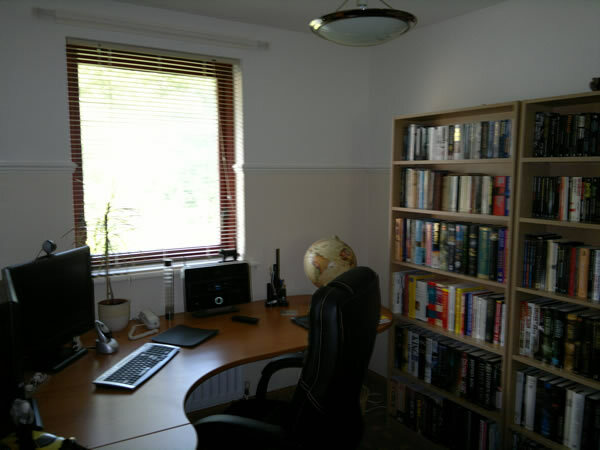 The only downside is that as well as a very large desk that occupies the room there walls are lined with a number of bookcases containing… yep you guessed it… books. After painting one wall I realised I wasn’t going to get far unless the bookcases were emptied and moved it. And what fun that was. The main bedroom became the temporary store with books piled up around the bed as well as any other junk that was cleared out from the study. The bookcases themselves took up residency on the landing whilst the desk had to remain in the room and carefully moved as required. Finally though I was able to get the study painted and a lot better it looked. But that wasn’t the end of the matter. Nope. You see the bookcases were half height – about 4 ft – and had been overflowing for a while. So I decided to purchase three new ones that would give me some extra shelf space. After assembling them I replaced the books. It was then that I remembered a trunk full of books tucked away in the cupboard beneath the stairs. In fact it was well and truly hidden beneath stacks of videos which had to come out first before I could get to the trunk. These books were soon added to the new shelves and then I realised there was a large box of paperbacks in the bottom of a wardrobe in the bedroom. Out these came, unfortunately the new bookcases were quickly filled so another bookcase was put into the built in wardrobe in the study (this was originally the second bedroom) and this soon started to fill. Finally though the study was complete. It then took another few days to get the rest of the house back into some order including tidying up the cupboard under the stairs and reclaiming the main bedroom for its rightful purpose. Four trips to the skip later things have vastly improved. Have I finished doing the jobs around the house? Have I hell! Somewhere beneath the boxes and artifacts that have collected in the spare bedroom over recent years I swear there is actually a bed and there are a few items in the hall that have still yet to find a new home. I also have a horrible feeling that there are four more boxes of books that I put up in the roof a while back when shelf space was running low though where I’m going to put them now will be another matter. Of course the task of re-tiling the bathroom also still awaits to be done. I have the tiles, borrowed a tile cutter and even got new fittings, taps etc all I need to do is make a start… but it won’t be just yet… its time I got back to the writing. There’s a book I want to write and its screaming at me to pull my finger out! A Novel In 7 Days?